I'm fashionably late to the party due to my computer bug... But a girl just can't not show up to this party!! 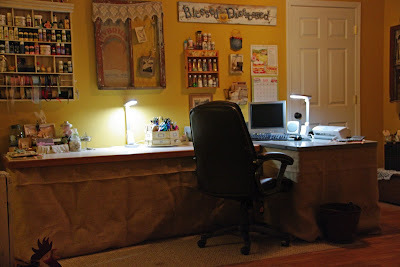 My studio is my sanctuary where I retreat from the hustle and bustle of everyday life. It is where my creative heart is nurtured and takes flight; and my need to create is satisfied. 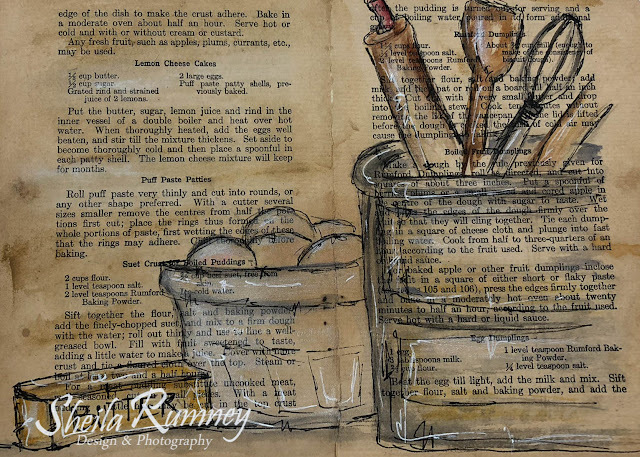 Being a country girl at heart, I surround myself with the things that remind me of an old farm house… things that I love which bring a sense of calm and inspiration. My artwork, along with my children’s artwork, resides with antiques finds and family treasures to make it truly my unique space. When we first created this cozy nook in our basement rec room area, it was my hope not to be isolated in a room far from my family so I could still interact with my DH and kiddos but still have my space. The wonderful thing about not being secluded is there are many times when my kiddos join me and we create together. Their creativity is not bound by lines, it soars without restriction. It is where we talk, create and connect. Time spent with them creating is precious to my soul. 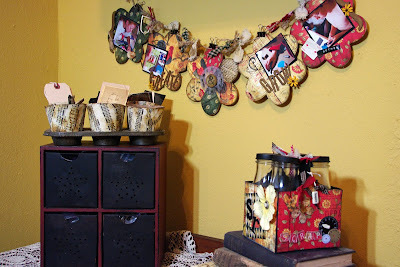 Because my art has grown from paper crafting to mixed media art, soldering and fabric art, my collection of items that I use in my artwork have grown. My shelves are ever changing as I use my collections of finds in my artwork and restock with other treasures from my antique adventures with my beloved friends and daughter. I just have to look around to gather inspiration and find that perfect bit or bauble to make my artwork. This space defines me… my love of things old, worn, distressed and loved. It is a place where life slows down if only for a few precious moments, where I reconnect with me and that little girl so eager to spread her wings and take flight. It is a place where I am blessed to just be Me. 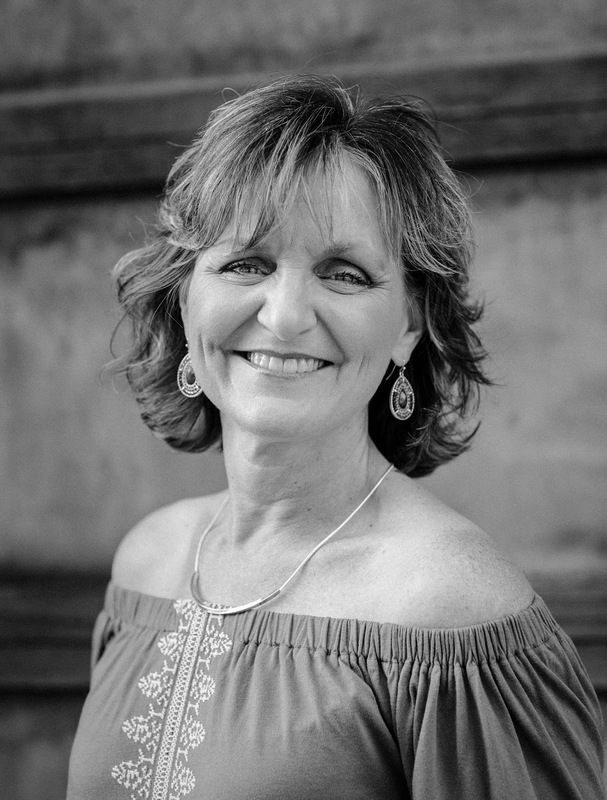 Thank you Karen for hosting such a wonderful blog party. And thank you for visiting my space. Don't forget to visit all of the other bloggers spaces. I love your space, especially your shadow boxes. I have a few of those but hadn't thought of changing them out. Great idea. love it...and what a comfy chair to work from..I need one of those! What a great space! Love all your little vignettes of your treasures. Great space! I love all your treasures that make your space unique. Great shelves!! 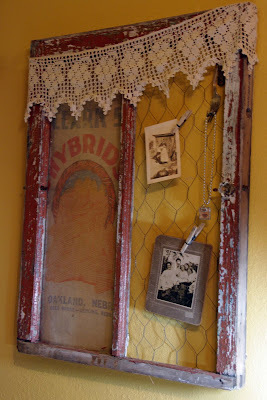 I also love things that are old and loved... makes them oh so much better! ;) Thanks for the tour. Your space is great. What a nice place to be creative. I just adore your room! 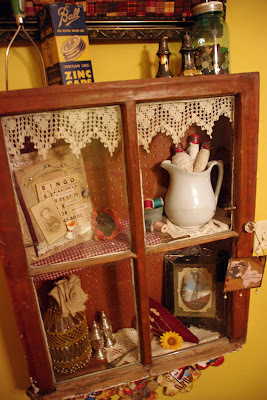 Your shadow boxes are lovely and I love all the vintage touches around the room. thanks for sharing and inspiring me. You space is awesome! So nice and clutter free...so all your big fresh ideas can fill it up!! Love the rustic elements, too! Such a cute space! I love all your vintage touches! it is a beautiful place to creat! great job. Wonderful. You have a lovely space. Thanks for sharing it with us. Please...please, please tell me it took you hours to clean and organize. Where is my broom...I know there is a floor here somewhere. Creativity and chaos go hand in hand in my studio. I agree...it is where I am happiest. I really enjoyed seeing your creative space. I love all of the vintage touches! And oh, how organized!! Does it always look like that? I noticed the Farmstead banner right away so I'm guessing you must live somewhere in the Kansas City vicinity. I live in the "Northland" and have been to Farmstead once last fall. Such a wonderful place! I hopefully will be able to attend the event in July. I really like your space. And I really like how your wall color is unexpected and sets off all of your decorations. It really gives the room a warm and inviting feeling. Hope you are enjoying the party! love your space~great treasures too. My studio is my retreat too. Yours is just beautiful and decorated and organized so well. You are truly blessed....I know about the distressed part but I bet when you work there you become de-stressed or un-stressed....great space!!! Beautiful space to create what ever you wish to. Love that you change up the shelves...thanks for sharing it all with us. Hi Sheila! Your creative space is great! I love all the primitive pieces you have. It looks so cozy and I can see where your inspiration comes from. Oh my, what a great room! I especially loved your boxed shelves that ever-changing - just lovely! Sheila, your creative place is really awesome. I'm glad you got your bug worked out and could come to the party. That is such a warm, homey place.It just make feel all cozy looking at it. You have such a comfy looking chair to work in and I love all of your treasures hanging on the wall. I love that you can still be near your children and family and that they can come in and create with you. It is so inspirational to see you seating in a spot that reminds you who you are. Some day, come and take a peek at my daughter and my blog, if you would like. It is three months old and not really just about my jewelry. I love paper crafting...she loves a million other things like vintage fashion. We were not in any shape to photograph but I am loving the tours. Hope that you have quite recovered from your computer woes. i love those shelves on your wall and the ability you have to change them out every know and then. Thanks for sharing. 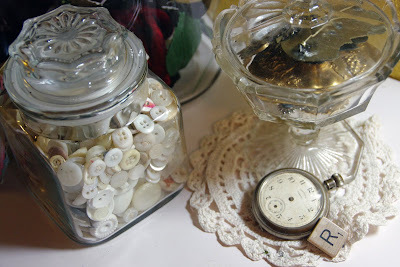 I love all the rustic, vintage and time warn treasures in your creative space. We share something special you and I... we both create with our kids in the basement! Pop over to my party post when you can and you'll see what I mean! Oh what a sweet space you have. I love the shadow boxes. So glad I stopped by. Your studio is beautiful. I love your yellow walls and the shadow boxes. Thank you for letting us visit! Hello! I just adore your space. When I was reading about you - it was like reading my own feelings. 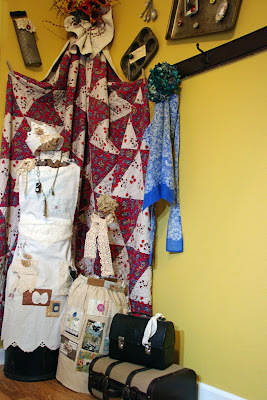 From scrapbook to mixed media and fabric . . . isn't it great that we've found all of this? I just can't decide what I want to do next! Look forward to seeing more of your creations . . . This looks like a great space! So roomy and comfy! I love the burlap skirt! 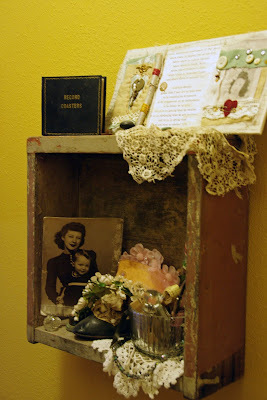 I love your creative haven that includes family heirlooms, flea market finds, and your own art work. Your space is so cozy and serene. I love the rustic elements too. Thank you for sharing. WOW!!! What a fun tour and your space is beautiful. I love all of your shadow boxes, filled with goodies. Thanks so much for sharing with us. 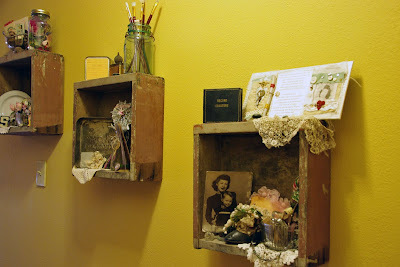 I love your studio but especially those old boxes on the wall to display little things - those are great!!! WOW! Sheila it is wonderful! What a place to dream. I love the shadow boxes...so awesome! What a wonderful studio you have. I love all of your shadow box type creations..I think you probably change them the way I'll change my dress forms. :0) Thanks so much for sharing your space with me. I'd love for you to come over for a stroll through my studio. It's been an ongoing transformation for almost a year since I moved in to our new home. Thanks for sharing your creative space. Your little vignettes are wonderful! I had so much fun taking a peek into your room, First of all I love that color on your walls, and it looks like such an inviting and warm place to hang out and get creative.. Thanks again for the tour. What a wonderful studio/creative space you have! I think what I like best is that you are not, as you said, cut off from your family and how you kids join you in your creativity. Sometimes it's nice to be alone to concentrate on certain things, but I like knowing my family is around,too! Your studio is so you! 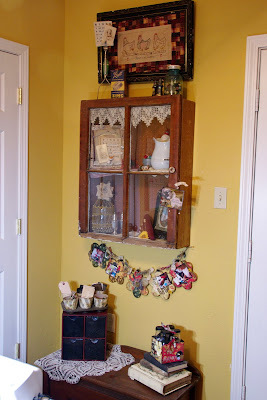 I love the box shelfs along your wall- that contain treasures from friends and family. Thanks for giving us a peek :) Have a great week! Aaaaah, it's darling and NO, a girl just can't NOT show up, chick! Taking me a long time to get to the WBC, sugar. Nice to meet you. Ill be Back to check out what you do. Its such a cheerful spot! Such a beautifully spacious studio! Thank you for sharing your space with us all. Thanks for your comment about mine too! I am following you now as well! 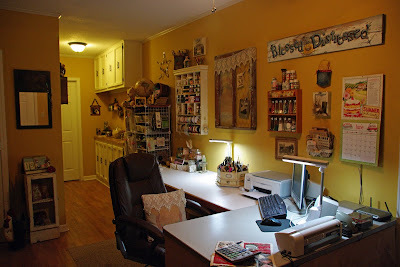 Love the rustic touch you gave to your place of creativity. I love the vignettes of all your treasures. Thank you for sharing. 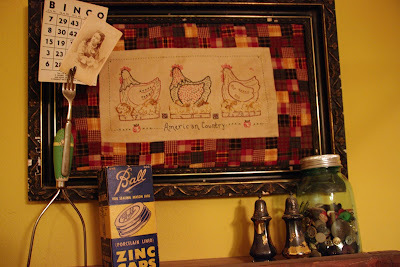 I love your space....especially the farmhouse treasures. They are my favorites too. I'm late getting around the tour! Have to say how lovely your space is and how great it is that you're creating memories with your kids. Thanks for inviting us to visit! oh my goodness, i adore your space. it's truly so warm and inspiring. thanks for sharing!! I love your space and I love your art ...the wooden boxes and window frame art on your wall are cool. I create with my children as well..a special time we share.